Stepping into the magic of Italy is so deliciously fulfilling in this wonderful memoir, Passion on the Vine: A Memoir of Food, Wine, and Family in the Heart of Italy. Sergio Esposito's heartwarming tale of coming of age and his intriguing and perilous path to becoming one of the greatest purveyors of the world's most oustanding wines. If you have been to Italy you will love this book, if you plan to travel to Italy you must read this book, if you love and want to know Italian wine there is no better story of its meaning and heritage. 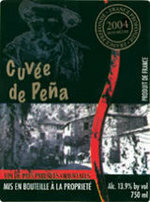 Cuvee de Pena is a "Vin De Pays" (country wine), a step in the French wine classification which is above table wine, produced in Pyrénées-Orientales in the South of France near the border of Spain. It is imported by Hand Picked Selections, who Robert Parker says is "Perhaps the top importer in the United States for specializing in wines that sell for less than $10." Here is an excellent opportunity to learn and explore some of the greatest wines of the world. At the Warwick Hotel (W. 54th St. & 6th Ave.) in New York. All EWS tastings and courses feature: Scrumptious cheeses from Murray’s Cheese Shop, delicious breads from Tom Cat Bakery and INAO professional wine tasting glasses (Parker’s choice). I checked out the humongous new Stew Leonard's Wines of Clifton back in 2008. I did not like it then. Since then I have changed my mind. I started to frequent the Paramus store because its right next door to our favorite Trader Joe's. Now I love Stew Leonard Wines for these five reasons. Henry Reidy of Strawberry Street Vineyard turned me on to these two very good wines from Virginia. 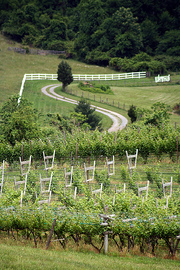 These wines demonstrate Virginia Winemaker's ability to make world class juice. Get in your car and take a quick trip to Greece, leaving your passport at home. Drive to 1045 Broad Street in Bloomfield, near Holsten's and Cafe Tartufo, step inside and you are in Greece. Beth Case wrote to tell us about The Wine School of Philadelphia. I checked it out and this looks like a great place to learn and experience wine. I was wandering around the Lower East Side with Diana looking for a place for a quiet drink after the movies. Inoteca and Tre were packed. The streets of the Lower East Side were packed on this Saturday night with entranced tourists, gritty locals, and adorned suburbanites. It was quite a scene. We headed uptown accross Houston and found a quiet little wine and coffee bar called The Tasting Room. We tasted a few wines. This one we liked alot.